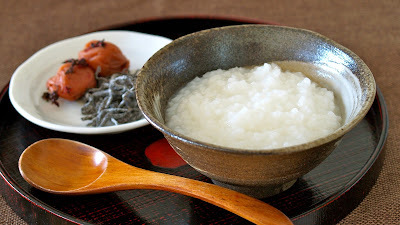 Using cooked rice is a quick and easy way to make Rice Porridge (Congee)! 1. Put cooked rice and water in a pot. 2. Bring to a boil then turn down to low and cook for 10 minutes. *if you want the rice water, skim the liquid. 3. Stop the heat, cover, then steam for 10 minutes. *you can grate the congee for baby food. You can eat with Umeboshi (pickled plum), Shio-Kombu (salted kelp), salmon flakes, or any kind of rice seasoning of your choice!